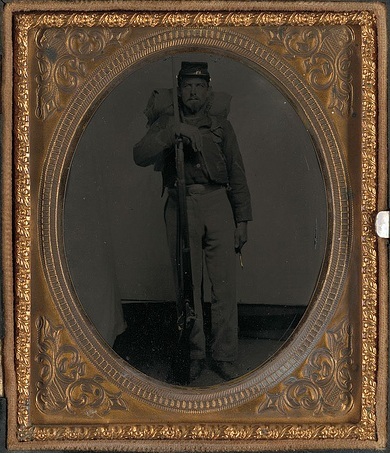 In his next letter to his sister Abbie written on 6 April 1862, Oliver apologizes for being tardy in his correspondence, but blames it on the almost constant movement of his regiment and what he calls “light marching order.” Because of this configuration, he has been unable to carrying along his writing materials. It was the hardest march I ever saw; mud over shoes, water often nearly knee deep, our haversacks empty, stomachs ditto. Some of our men were so completely exhausted that as soon as they got to the camp they fell upon the ground and could not be aroused. I was put upon picket the first night which I did not relish very much after the fatigue of marching, but lucky for me I had a pair of dry stocking in my pocket which were worth their weight in gold at such a time. The marching was not over for the men of the 8th CVI and the 4th Rhode Island. The following day, they were on the move again. We again took up our line of march about 11 o’clock the next day, leaving a few companies to guard the barracks, on the road towards Morehead and Beaufort. The commanders obviously observed the effects of the previous day’s march on the soldiers and realized that today was not the best day for marching without some therapy. We had proceeded but a short distance when we were halted and a day’s rations of hardtack and about ½ gill of whiskey given to each man. Our march was rather hard for the reason that we were so stiffened up by our last night’s tramp, but as we only marched nine miles we stood it pretty well. By the way, from my best research, ½ gill of whiskey would be about 10 ounces, an ample amount to ease the pain of the march! There was more marching in store for Oliver and his fellow soldiers in the days to come.